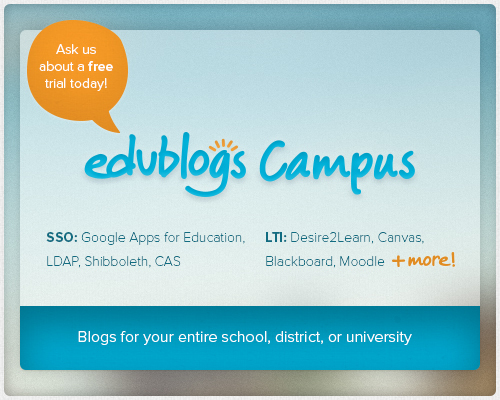 Edublogs Campus now integrates with Google Apps, Desire2Learn, Moodle, Canvas, Blackboard and more! With Edublogs Campus, we make it super easy for every student, staff, and faculty member to have their own WordPress blog or website. And as of today, we’re excited to share, we can now integrate with many popular student management and learning tools, including Google Apps for Education and Learning Management Systems like Desire2Learn, Canvas, Moodle, and Blackboard. If your school is already using Google Apps for Education, we can enable single sign on to manage user accounts, passwords, and blog creation. This will mean that students and staff will have one less password to remember and it is even easier to allow users to create accounts and blogs without the need for request forms, CSV uploads, or other time consuming processes. For your LMS and other learning tools, we can now harness LTI to handle user account and blog creations. Future plans include more detailed integration with many popular tools like links to class blogs within a course, auto-provisioning blogs for students in a course, and more. We’ll work closely with our Edublogs Campus clients to determine these future plans, needs, and timelines! If you already have a Campus network, or if you’d like to learn more about getting setup, get it touch with us at support@edublogs.org. For new networks, we can usually have you up and running in as little as a day. We can even migrate existing WordPress networks over to Edublogs as well. Don’t forget, we’re happy to setup free trials for Campus, so giving us a try is risk free, fast, and easy! Does it include Haiku LMS?